NEWARK, Del. 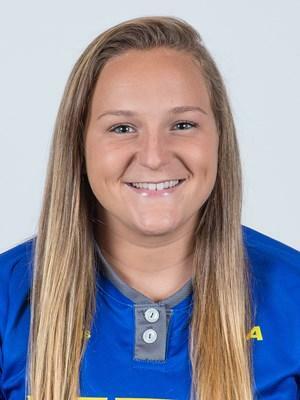 – Delaware scored five runs in each of the first two innings and cruised to a 13-3 victory over Delaware State Wednesday afternoon at the UD Softball Stadium. The Blue Hens (17-20) wasted little time in taking control, pushing across five runs with two outs in the bottom of the first. Brittney Mendoza singled home the first two runs of the contest, while Reyna de Jesus followed with an RBI double to center. Karolina Flores then doubled home a run, while Chayanna Gallardo added an RBI single in the frame. Consecutive doubles by Brooke Glanden (Lake Forest) and Anna Steinmetz made it a 6-0 game in the second inning, before de Jesus added a run-scoring single. Flores followed with her second RBI double of the game, while Hanna Garber capped the rally with a two-run single. Flores singled home Glanden in the bottom of the third, before Delaware added a pair of runs in the fourth on a sacrifice fly by Halle Kisamore and an RBI double by Mendoza. The Hornets (6-24) scored three times in the top of the fifth as Jordan Casey singled home a run before Jaelyn Baker delivered a two-run single, before the game ended due to the mercy rule. Flores finished 3 for 3 with three RBI and two runs scored to pace the 13-hit Blue Hen attack. Garber, Steinmetz, Mendoza and de Jesus each added two hits on the afternoon, with Mendoza driving home three and Glanden scoring three times. Sarah Piening went the distance in the circle for UD, picking up her ninth win of the season after allowing three runs on seven hits with six strikeouts.